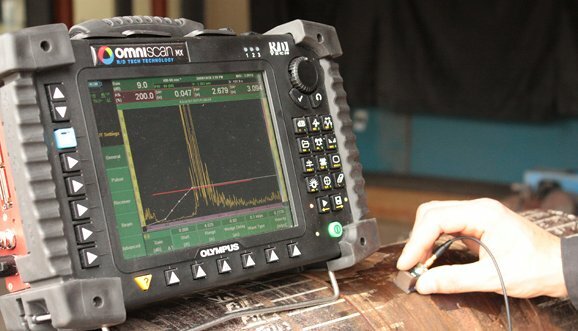 Ultrasonic Testing (UT) uses high frequency sound energy to manage and do examinations and make measurements. Ultrasonic (careful examination of something) can be used for flaw detection/evaluation, dimensional measurements, material description, and much more. Although there are some technologies employing ultrasound, the simplest explanation of what happens in this method is that sound energy is introduced via a transducer and spreads through the materials in the form of waves. When there is an (instance where things are uneven and interrupted) (such as a crack) in the wave path, part of the energy will be reflected back from the flaw surface. The reflected wave signal is changed into an electrical signal by the transducer and is displayed or recorded in a variety of ways. Both surface and subsurface defects can be detected making ultrasonics a volumetric testing method. Uses change/differ in complex difficulty from very small, hand-held manual units to very large, fancy (or smart) automated systems. This method is used to inspect a variety of product forms including castings, forming/creatings, and weldments. The (related to what holds something together and makes it strong) steel, automotive, (related to oil from the ground), power generation, and outer space businesses are a few examples that use ultrasonic (careful examination of something). 1.UT LEVEL-I Training and certification as per SNT-TC-1A OR CP-189. 2.UT LEVEL-II Training and certification as per SNT-TC-1A OR CP-189..